SHANGHAI (AP) — Mercedes driver Valtteri Bottas and Ferrari rival Sebastian Vettel led Friday’s practice sessions ahead of the Chinese Grand Prix. Off the track, Formula One prepared to celebrate its 1,000th race on Sunday. The first F1 race took place in 1950 at Silverstone, a converted World War II airfield in southern England. It was won by Giuseppe Farina driving an Alfa Romeo. Vettel was quickest in the morning session, and Bottas was slightly faster in the afternoon with Vettel right behind. The afternoon session was quicker overall with Bottas clocking 1 minute, 33.330 seconds on the track located about 40 kilometers (25 miles) from downtown Shanghai. Vettel was timed in 1:33.357 in the afternoon, followed by Red Bull driver Max Verstappen (1:33.551) and Lewis Hamilton (1:34.037) in his Mercedes. Bottas and Hamilton have each won one of the first two races this season. 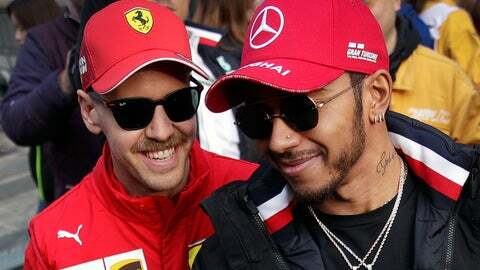 Mercedes, Ferrari and Red Bull dominate and are expected to do the same in qualifying on Saturday and in Sunday’s race. Shanghai is far from Formula One’s most tradition-steeped venues. That honor would go Monaco, Monza, Spa or Silverstone. But the Chinese circuit will do the honors on Sunday.